Superintendent Jeanne Collins has a tidy explanation for the messy situation facing the Burlington School District. It's been "kind of like fixing an airplane while you're flying it," she said in an interview last week. By now, Burlington voters have a clearer view of the maintenance problems. The proposed budget they'll consider in a special election next month has a higher price tag than the one they rejected on Town Meeting Day. That's because the school board has since discovered that the original sum would have resulted in a deficit — for the fourth year in a row. The error lies in the fact that the original budget was based on the previous year's — rather than on actual spending, according to Melanson Heath & Company, an independent firm hired to look into the matter. Who's to blame for a blunder that seems to defy not just the tenets of basic accounting but also common sense? Mayor Miro Weinberger and several city councilors have decided Collins is the culprit, calling for her to step down. Collins has maintained she's simply fixing a problem she inherited when she became a superintendent, nearly a decade ago. And although the school board hadn't issued any pink slips as of press time Tuesday, it's calling for wholesale change in how the district manages its money. The ongoing hullabaloo has been a blur of numbers. Board members have alternately described the figures they are working with as "bad," "very good" and "very grey." The one thing they aren't, admits board chair Patrick Halladay, is "perfect." Collins traces the problem of "bad data" back to the finance director, who oversaw the budget when she first took the job, in 2005. She says Scott Lisle relied on an antiquated, self-built software system to run the budget numbers. He and Collins didn't part amicably, which, in her telling, left the next finance director, Michael Gilbar, stringing together the fiscal year 2012 budget based on a combination of the 2011 budget and what actual spending data he was able to extract from the old accounting system. Gilbar left after one year, and his replacement, Karen Groseclose, undertook what Collins considered an essential reform — a transition to a new accounting software system. But Groseclose departed last year, partway through the process. Today, David Larcombe, Collin's fourth finance director, is in charge. But the process of inputting data from the old system to the new still isn't complete — though Collins assured, "I think we are very, very close." Already a time-consuming task that has occasionally involved entering data by hand, it's been further complicated by the fact that many line items were coded incorrectly in the old system, according to Collins. It wasn't that the administration was deliberately overlooking actual spending figures, Collins said; it simply didn't have access to all the data required and couldn't accurately gauge spending in real time. "We truly believed at the time that it was adequate data," said Collins. "We knew we had difficulty getting the data, but it was the best data we had at the time." In an era of overspending, Collins said she might actually have been too frugal in this area. "I think we did underestimate how challenging the transition would be, and we didn't put enough resources into it." Halladay and several other school board members aren't sold on her story. "Before computers and software existed, there were ways to figure out how much money you had budgeted and when you were getting close to spending that amount of money," he said. He suggested that the district could have drawn better estimates by looking farther back and using an average of multiple past years' actual spending. "To say it's strictly an issue of technology really isn't accurate," he continued, adding that the auditors told the board as much. In both FY 2012 and 2013, the district ended the year with a deficit. It was a "complete surprise," Halladay said, when Larcombe told the board sometime around Town Meeting Day that the district would likely end FY 2014 in the red — again. That prompted the board to commission the audit, which showed that the 2015 budget, rejected by voters, would also have put the district on pace to overspend. Setting aside the struggles to draw up an accurate budget, there's the fact that the district has consistently spent beyond its means. "I don't have a great answer for how the overspending was occurring," Halladay said in an interview on May 2. One issue the auditors raised was insufficient oversight of payroll and vendor disbursements, or, as Halladay put it, "There were not the proper checks and balances to make sure that checks were going to balance." How does the all-volunteer board intend to fix that? On May 1, the finance committee approved a motion that would require the board to sign off on any new hires the administration wants to make. On May 7, it will consider beefing up a policy already on the books, which empowers the committee to keep closer tabs on spending as it occurs. Meanwhile, Weinberger appears to have his own reform plan. In the past, neither the mayor nor the city council has had any power over the school board or the budgets it puts before Burlington voters. But now that's changing. Two weeks ago, Weinberger offered the services of his chief administrative officer, Bob Rusten, to the district — and the school board accepted. The Burlington City Council is seriously debating whether it should be approving proposed school budgets before voters do. Frustration on the part of school board members has facilitated the city's involvement. "We have seen that we have not had responsible financial stewardship," said Liz Curry at a finance meeting on April 21. Finance chair Miriam Stoll said she was "completely flabbergasted and frustrated" by the budgeting process of past years and described the lack of oversight and controls as "embarrassing." The school board and the superintendent also disagree about who deserves credit for tackling the district's fiscal troubles. "Despite many comments to the contrary, the district does have its finances under control and is poised in the very near future to be in the black, running efficiently," Collins assured the board in an email on April 27. She attributed this to the software transition that she engineered, which, she said, enables the district to identify deficits earlier and comes with built-in controls to prevent overspending. The board, meanwhile, says it has been putting better "financial controls" in place during the last several weeks. Not content to leave things to the administration, the finance committee has been combing through past years' budgets. Still, Stoll told the city council on April 28, "We have a lot of work to do." 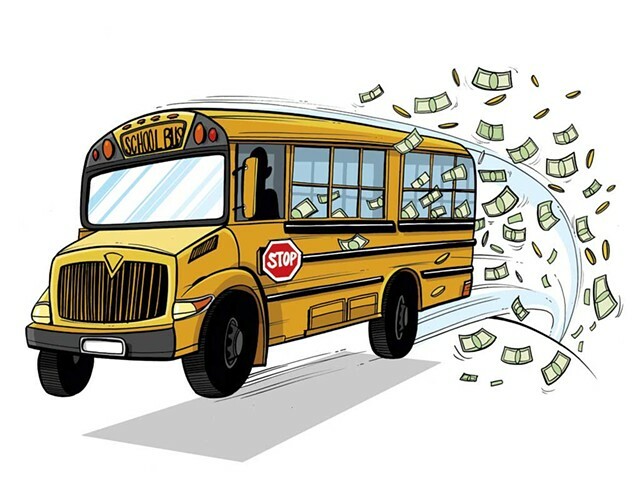 Adding to the strife: As the board worked to cut money from the 2015 budget, Collins requested additional "communications" funding to help the district craft its message. The board not only rejected that request but also instructed Collins to refer media requests to Halladay and Stoll. That decision didn't sit right with Keith Pillsbury, who's served on the board for 23 years. Citing it as one of the reasons he decided to resign at the end of June, Pillsbury wrote in a statement, "I did not agree with silencing the superintendent with the press." Collins insisted she's been up front all along about the district's budgeting challenges. But the board, including former members, is divided on that question. 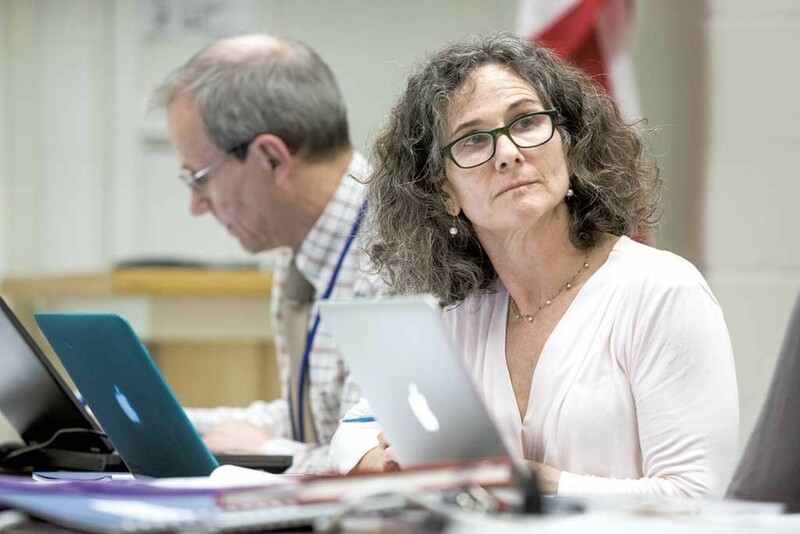 Eight-year board member Katherine Chasan, who sat on the finance committee until she lost her seat in March, stated at a recent public hearing before the board, "Superintendent Collins has been open and transparent in discussions and with documents every step of the way." 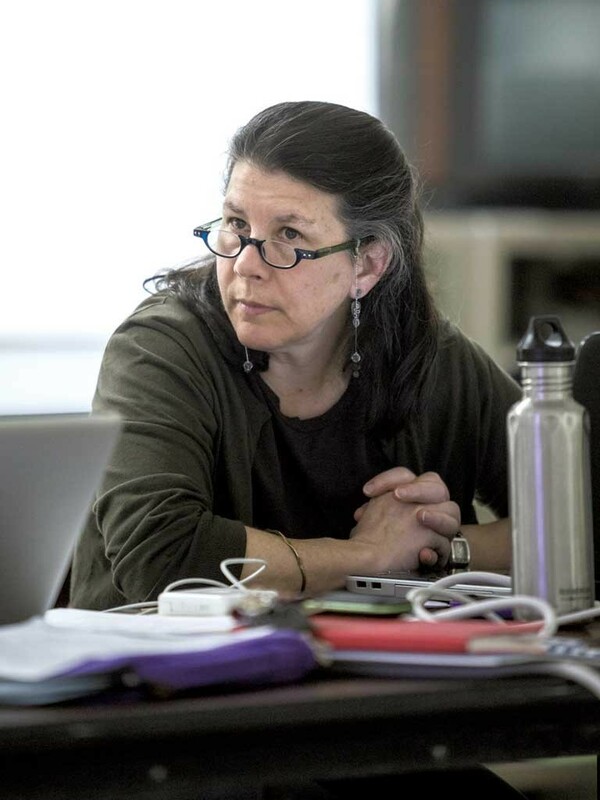 Rebecca Grimm, who stepped down in March after three years, had a different experience. "On the diversity and equity committee, which I chaired for a year, there were times when very specific data was requested, and it was not given." When it came to the budget, Grimm continued, "The response from the central office was, 'we do not want the board to get into line-item decision-making.'" That won't fly anymore, according to Curry, a current school board member in her second year. "I went from being on a board that had a huge blind spot about how the district's finances were being managed ... to being on a board that is basically focused on austerity and minimal growth." If the board does determine that Collins failed to fulfill her duty, it may have trouble trying to kick her to the curb. That's because the board neglected one of its duties when it forgot to formally evaluate Collins earlier this year, as required by her three-year contract with the district. "The proper evaluation procedure was not followed," Halladay explained. "It was an important thing that should have been done, but this is one of the challenges of an all-volunteer board. It's unfortunate for the board, and it's unfortunate for the superintendent." Collins' eight-page contract runs through June 30, 2016. On page six, it spells out the acceptable reasons for the board to fire the superintendent, which include "neglect of duty, inefficiency, or incompetency" or if she "fails to adequately address performance deficiencies of which she was duly notified by the Board." But the board could have a tough time making that case, legally, given that it failed to provide her with any performance benchmarks to begin with. Halladay declined to comment on the situation, but said, "In the abstract, when a board doesn't do its duty in the past, it can have consequences on the range of actions it can take in the future." The board could also terminate Collins "without cause," but in that case it would have to pay her annual $133,000 salary through 2016, plus benefits, in one lump payment. It's a simpler calculation, at least compared to the school budget, but it's still a sum that Burlington voters likely won't want to pay for.